Classic beige trench is a stable in any gal’s closet but this season SG is in adoration with colorful trenches available in shopping land. Maybe it is the age factor as Savvy Sister suggests. As a gal grows older, she becomes enamor with brightly color pieces. 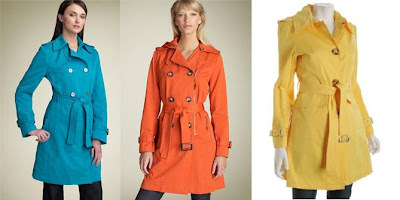 A brightly color trench will sure add a dash of glam and style to all the grey and black this fall and winter. So are you a color or classic trench type of gal? Love love love the hot pink ones!! Well, lets see...I have the classic tan trench as well as the elegant black trench. 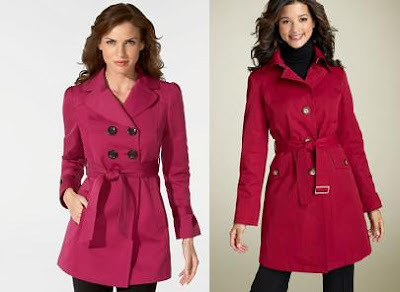 I have always wanted a red trench and the black & white check one too. And now that I saw that fabulous orange one...well that is a must have too! personally i prefer the Classic beige trench..
My fav. is the double breasted juicy one. i love these. I can't do classic beige. Looks hideous against my skin tone. I have black and just bought a gray one. Am thinking about red, but love the berry toned ones you picked! I love all of these trenchs. Off course I think the basic colours sometimes are important, but these are must more interesting. I have a red one from Zara, I like it, but that's just my thought. Oh ya, love as much color as possible, turquoise for me! Oh wow, I adore the raspberry one! i need a classic one, but that maladrino berry trench is gorgeous! I have a "classic" black trench, but I would love a colored one too. These are all lovely--even if it is an unusual tone I feel the shape of a trench never goes out of style. I love a good trench—in anything but the bog-standard beige! I have a pink one I love. Just got a red one at plato's closet for like 20 bucks it looks just like the hot pink one i love it! these are so cute! The orange coat looks great. thank you for the info on the Baccarat lights. Will have to check it out. I finally managed to get myself basic black and tan trench this year (very cheaply mind you) .. should I venture into more colours! that's an interesting thought. Lovely, specially the red one and the blue one !! Bebe had some similar ones last year. They were more metallic, though. I had to restrain myself from getting one. Especially the ice blue. i saw a really pretty berry pink trench at target. i didn't check the price but i'm sure it's affordable. From GG, I remember that spring scene where Elise was wearing a pale pink trench and that other scene where Jenny was wearing the yellow trench. I adored those!